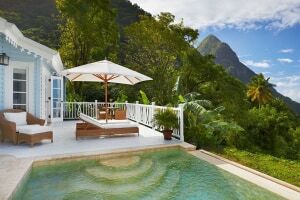 Dotted along the pristine waters of the Caribbean Sea and the piton mountains experience the sweet tropical life at the Sugar Beach resort. 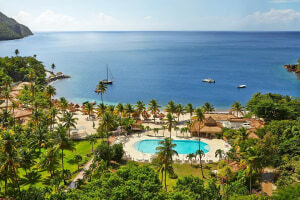 Strongly rooted with a history, the resort stands on a site that was once an 18th-century sugar plantation. 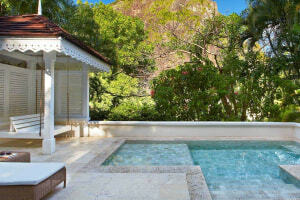 Its wrapped in the spectacular views of the rainforest and the UNESCO heritage-listed Pitons. Marveled with all the amenities, the resort has three on-site restaurants, a swimming pool, gym and spa for pure indulgence. 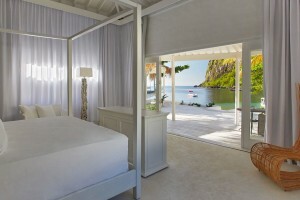 The rooms serve as your personal sanctuary that offers a memorable island vacation. 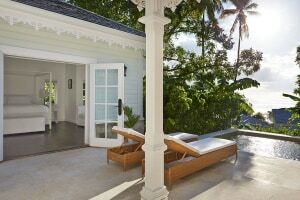 The resort is also crowned to be ‘best in the world’ by Conde Nast Traveller and one among the top resorts in Caribbean Islands. 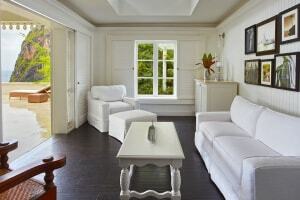 A French-Caribbean flair fringed with sandy beach. 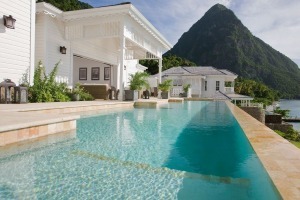 Set right along the shores of Anse des Pitons, the bar is the most sought to place for those magical Caribbean sunsets. Serving the best shaken and stirred cocktails you could also accompany it with pizzas, burgers and other international favorites. 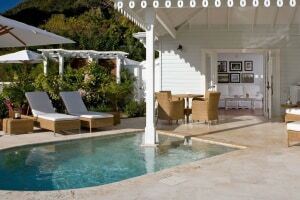 Exuding the old-world colonial charm, the Great Room Restaurant serves everything Caribbean. Packed a must-try menu it utilizes the freshest ingredients and few signature dishes such as seared scallops on a puree of Jerusalem artichoke, tender Kobe beef with rich red wine jus and perfectly cooked mahi-mahi with green fig mash and tropical salsa. You could also accompany your dishes with some of the premium wines. Kindly maintain cocktail attire for this restaurant. 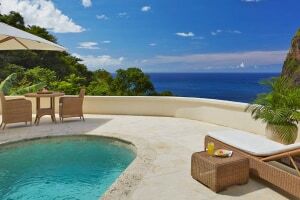 Set on the ground floor of the Great Restaurant, the Terrace serves the best Caribbean view. It offers breakfast favorites ranging from continental to a la carte. Sprinkled with flavors, enjoy some delectable Caribbean delicacies at the Bayside Restaurant. Open for lunch and dinner, this restaurant sits just feet away from white sandy shores graced with the beautiful view of the pitons. You get to taste gourmet pizzas baked in wood-fired oven, sandwiches or grilled catch of the day. A perfect rendezvous for the rum lovers, this bar is chic and has everything. It provides professional 'rummelier' to help you select the finest native or international rums. To tantalize your taste it offers Asian-inspired menu and sushi platter that will go well with the spirits. Go traditional at the Palm Court Bar and Lounge as you sip on to some English afternoon tea. It serves the classic combination of scones with jam or cream and finger sandwiches. In the evening the place is lit up with some cocktails, mixed drinks, wines and beers. The luxurious spa offers a contemporary spin on ancient Asian healing techniques and age-old beauty recipes that feature the benefits of fresh, natural, quality ingredients. Indulge mind and body in a heartfelt and surprisingly different Alila’s luxury spa experience. Kindly reach the spa 15 minutes prior for spa consultation.